Greenlining Institute's UpLiftCA site added a Resource Finder to help connect individuals and groups with climate change resources. While California has been forging ahead with policies and incentives to cut the state’s greenhouse gas emissions, it hasn’t always been easy for individuals and communities to access those programs. The Greenlining Institute has created a website to help people find and access these state resources, including funds from the state’s cap-and-trade system. The site guides visitors to information about the state’s various programs. Individuals, community groups, small businesses, tribes, and local government agencies can find information about programs and grants they can use to help them reduce their carbon footprint, from clean car incentives to solar power grants to weatherization of their homes. The site is also available in Spanish. 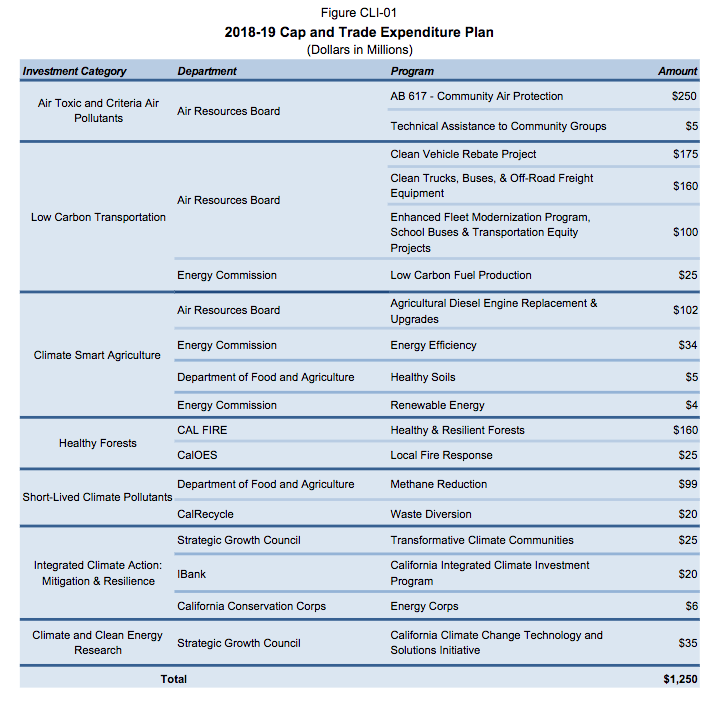 Unfortunately, several of these community-access programs could lose their funding if Governor Brown’s cap-and-trade expenditure plan proposal, which he announced at his recent State of the State address, remains unchanged. Brown’s plan reflects what happened behind the scenes last year when allies struggled to get the two-thirds vote needed to extend cap-and-trade without threat of a future legal challenge. At the time, some of the vote-trading was known; Brown’s plan shows what the rest of those votes cost. For example, dairy digesters—which aim to reduce methane from dairy facilities, but bring a host of other local air quality problems, frequently to low-income communities already burdened with pollution—got a large bump in funding, to $99 million. But crucial programs with less industrial backing were cut. Under Brown’s proposal, cap-and-trade would no longer fund programs for urban forestry, urban greening, nor the state’s low-income weatherization program, which provides funds not only for weather-proofing but also for installing solar power on low-income households. “We’re concerned that those were completely zeroed out” in Brown’s proposed spending plan, she said. Brown’s proposal also dramatically reduces the Transformative Climate Communities (TCC) planning grants. The TCC just awarded $140 million in implementation grants to three cities that created new community engagement processes for multi-faceted, interconnected investments. It also awarded another $1.5 million in planning grants, which help communities prepare for the larger implementation grants. The program was reduced to $25 million in Brown’s proposed 2018-2019 plan, which is the size of a single grant. Last year, said Wang, there were nineteen applications for those planning grants, and only ten communities received them. “The TCC process is building the capacity of communities to come together and plan for what they want,” she said. The $25 million in the proposed plan won’t be anywhere near as much of an incentive for communities to do the work, nor will it inspire other communities to take it on. The irony is that, in past years, these yearly negotiations over how to spend the forty percent of cap-and-trade funds that is unallocated have focused on dividing up a smaller amount of revenue than what’s available this year, and into the foreseeable future. With the extension of cap-and-trade, the quarterly auctions have, as predicted, brought in more money as industries subject to the cap have realized that it’s not going away and they are going to have to plan ahead for a shrinking emissions cap in the future. More money also means more players wanting a piece of it. That is, these smaller but important and beneficial programs—especially to local communities—are being cut out of the plan even though there is more money to spend. A look at the proposed spending plan shows that it’s possible the TCC money has been moved over to fund programs under A.B. 617, which was a companion bill to the cap-and-trade extension. A.B. 617 was supposed to help by replacing, in a separate bill, a section of the cap-and-trade bill that addressed local air quality. The oil industry objected to the notion that regional air quality districts could also mandate greenhouse gas emission limits, in addition to the state’s Air Resources Board, while local communities charged that cap-and-trade was leading to worse local air quality, and that local air quality districts had to have the power to address that. The compromise, which seems to have pleased few, was A.B. 617, which requires the ARB to increase monitoring and reporting on local air pollution. The still-undefined A.B. 617 programs will receive $250 million under Brown’s proposal, the highest amount for any single program on the list. The governor’s proposal is not set in stone. When the upcoming spring cap-and-trade auction results are in, it will be clearer how much money there is to divvy up. Brown will issue his budget revision in May, and the Senate and Assembly will both weigh in with their own spending priorities before the plan is finalized and voted on this summer. Cap-and-trade is working, says CARB, but needs to work harder. Meanwhile federal support is disappearing, and the administration may actively undermine the state's work. And disagreement about a definition cloaks a wider point of conflict on cap-and-trade. California reauthorized its cap-and-trade program aimed at reducing greenhouse gas emissions. It's a landmark victory and a rare bipartisan accord; it brings some certainty to California climate change policy-- and it leaves a lot of open questions.